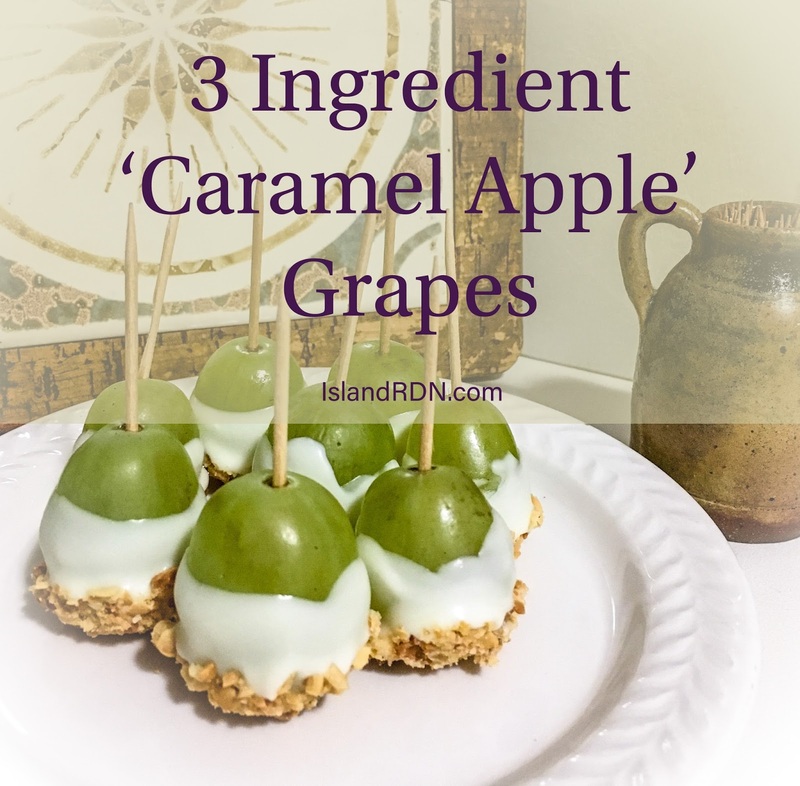 If you like caramel apples, these are for you! They taste like a bite size caramel apple. They are only three ingredients and require no baking. 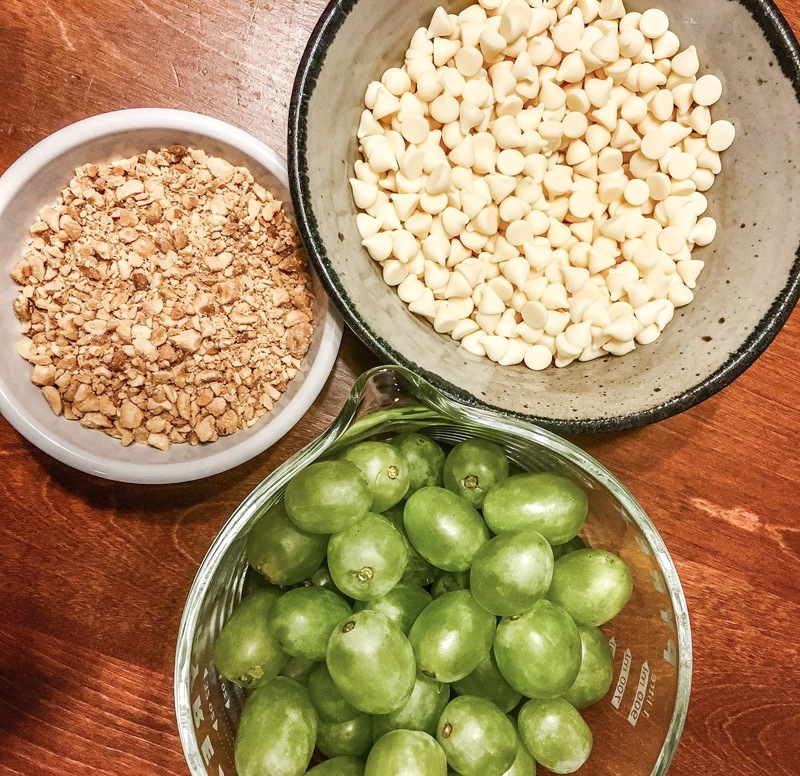 All you need is green grapes, white chocolate chips, and peanuts! These are great in the USVI since grapes are usually easy to find and affordable, as well as peanuts and white chocolate for baking. treat for bringing to potlucks and family dinners. They fly off the plate! It’s seriously hard for me not to eat every other one while I am making them. I have to demonstrate mad self restraint while preparing these, which is extremely simple and fast! I have to say for as many of these I do eat, I don’t feel as bad as if I were digging into the other holiday cookies. 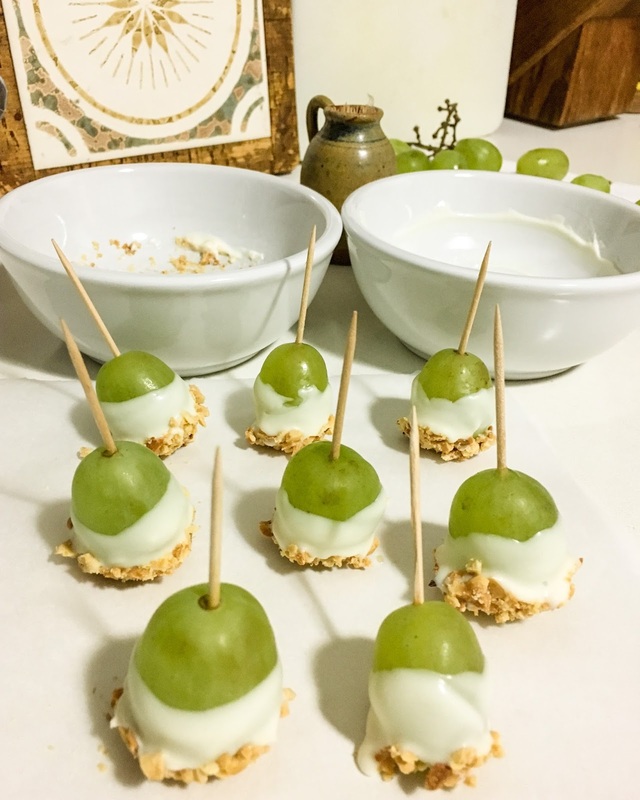 They are relatively low calorie and low fat compared to other desserts, and the grapes and peanuts do offer some nutritional benefit such as fiber, polyunsaturated fats, and antioxidants. Even so, you always want to be careful with portion sizes. We are all aware of the dangers of over eating during the holidays! When attending a holiday party, you should still enjoy the food you love. The key is PORTION SIZE. One way to control portion size is by choosing a reasonably sized plate, aim for less than 8 inches in diameter, and fill with small amounts of your favorite foods. All the food has to be touching it! No pilling extra cookies and sweets on top! Limit yourself to the one plate, saving room for your favorites and passing on the items you can live without. This allows us to enjoy our favorite holiday food traditions, along with quality time with friends and family, without quilt! To make these amazing treats, start by washing grapes and drying thoroughly with paper towels. Crush peanuts if needed. I put them in a plastic bag and use the back of an ice cream scoop to crush them; sometimes you have to be resourceful on the island! You can also buy peanuts already crushed or use a rolling pin. Place white chocolate chips in microwave safe bowl and microwave for 30 secs at a time, stirring in between until smoothy melted. Any white baking chocolate can be used and heated per instructions on the box. I have used many different brands of chocolate depending where I have lived and what was available. Once the chocolate is melted I create a kind of assembly line and dip the grapes first into the chocolate and then the peanuts. Place on wax paper to dry. Voila! Your done. Just transfer to dish for serving or storage! Melt Chocolate in microwave safe bowl at 30 sec increments, stirring in between. 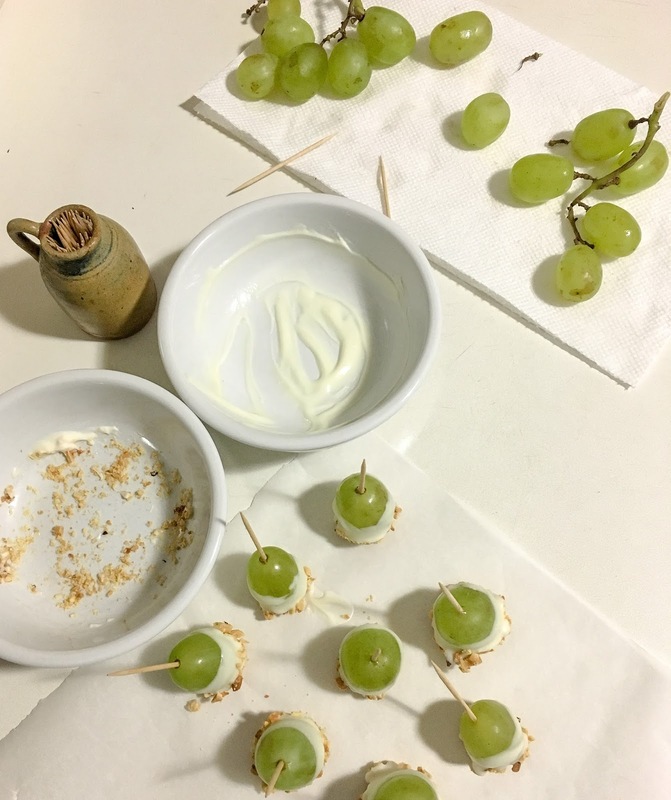 Dip grapes in chocolate and then in peanuts. Place on wax paper and allow chocolate to cool. Transfer to dish for serving or storage. Store in the fridge for 1-2 days.